So quickly let me share with you guys what I recently purchased. Let me know if you as excited as me to read a review on any of these products as I am to share the reviews. 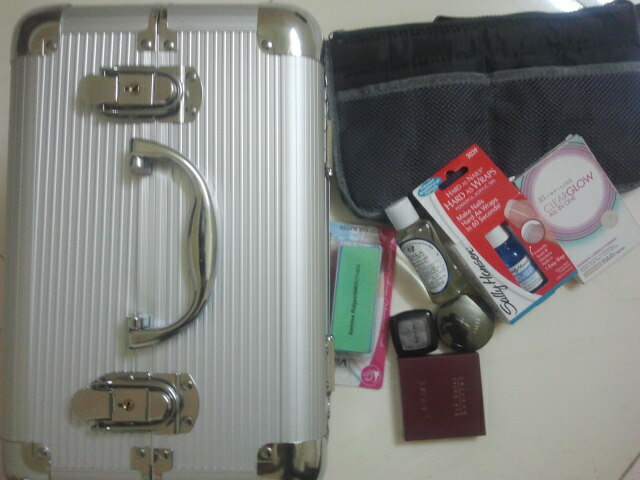 The grey case on the top right is a purse organizer I got from Fashion & You. Everything about organizing excites me after moving into our new home. Did I hear someone call me "Monica" again? Maybelline Clearglow all in one compact powder has found its 4th piece to my vanity. I love this product but have just one reservation. I think I should stop here this product deserves a review of it own. Sally Hansen Hard as Wraps to help grow my nails. I use my nails for everything I shouldn't be doing with them right from opening cans to scratching unwanted things off a surface. This month I have decided to care about my nails and therefore this fast drying Nail treatment which was awesome on its first use itself; my nails had the perfect shine for 3 days. Will now try to use it as a top coat and put the 60 seconds to another test. Also bought a Virgo 4 sided nail care tool: buffer, shaper (forgot what the other 2 sides are for).Frankly I dint see a huge difference post use. Infact I feared the surface of my nails looked damaged, not sure if it is supposed to look like that while buffing. time to watch some Videos on Nail care:) Share your nail care secrets with me if you have any. Gala's Nail polish Thinner for all those bottles that have felt ignored. Lakme eyeshadow Quad in 'Peacock'. Super love this; had been on the lookout of this discontinued item for very long. Saving the best for last, I bought the NYX Beanie eyeshadow. I will soon be creating a look using this eyeshadow. Coming soon on my Youtube channel.